30% glass filled nylon rods have 200% better strength than general purpose nylon but it is highly abrasive and will abraid or gall mating surfaces. Glass filled nylon is used in high strength, structural applications. Nylon 6/6 Lead Times May Apply for Some Sizes. 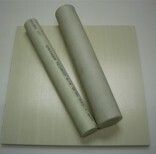 Nylon 6 is cast and comes in 2 ft standard lengths. Nylon 6 are Non Stock sizes for Mill, Lead Times and Minimum Orders will Apply. Note: Sample Charges may apply on particular non stock items!